The United Brethren Church has the distinction of being the first denomination to actually begin in the United States. Other denominations existed at the time (Lutheran, Reformed, Mennonite, and others), but they were transplants from Europe. The United Brethren church was truly "Made in America." It was 1767, and an inter-denominational renewal movement was sweeping through the colonies. Back then, Christians would gather in what they called "Great Meetings." These were lively affairs. Several hundred people from all over might spend several days hearing a string of stirring speakers. Isaac Long hosted a Great Meeting at his big barn in Lancaster, Pennsylvania. Martin Boehm, a Mennonite preacher, told his story of becoming a Christian and a minister. It deeply moved William Otterbein, a German Reformed pastor. Otterbein left his seat, embraced Boehm, and said loud enough for everyone to hear, "Wir sind bruder" (German for "We are Brethren"). Out of this revival movement came a new denomination, and it took its name from Otterbein's words: United Brethren in Christ. If you would like to know more about the United Brethren Denomination, visit our denominational website at http://www.ub.org. In 1884, the Tulare Circuit of the United Brethren Church began a mission Sunday School in the Lakeside area of Tulare County. Soon after establishment, the new church relocated to the new town of Pixley. Services were held in a house which doubled as the parsonage until the present church building was constructed in the 1920's -- the first church building in Pixley. The Church of the United Brethren in Christ, USA, consists of about 200 churches and other ministries throughout the United States. It also oversees churches in Haiti and India. We are part of an international United Brethren fellowship which includes work in 15 countries. 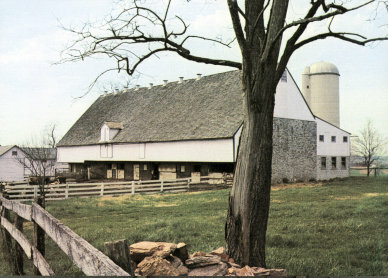 Isaac Long's barn, birthplace of the Church of the United Brethren in Christ.